Gulkand (Rose petal jam) can be taken on its own or added to milk/yogurt/ juices. Gulkand a general tonic of Ayurveda, is the delicious and naturally rich in calcium and has antioxidant activity. It has cooling properties thus it is beneficial in alleviating all the heat related problems like tiredness, lethargy, itching, aches and pains.it reduces acidity and stomach heat, helps in digestion. Add figs and gulkand in the blender and whizz until mashed. To this add yogurt, milk, vanilla essence, ice cubes and blend again until well combined and frothy. 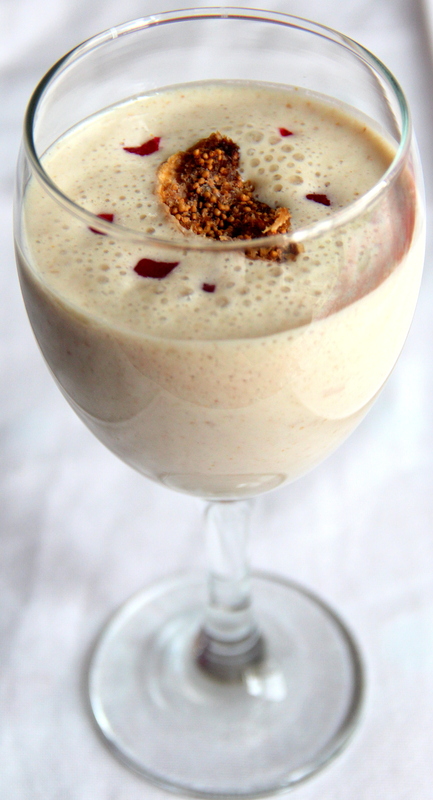 Pour the lassi into glass and garnish with figs/nuts. Gulkand is the jam made by soaking rose petals in honey/sugar syrup. You get it in the indian grocery store. Posted on July 19, 2014, in Juices/Beverages and tagged Benefits of Rose Petals, Chitras healthy kitchen, drchdietfood, Gulkhand Juice, Rose petals Jam, Summer healthy juices. Bookmark the permalink. 36 Comments. This sounds so good Chitra, I love rose petal jam and figs. It’s so good to know the health benefits, I had no idea and think this is a wonderful lassi. If I find it in the Indian store, can I just eat it on it’s own and will it have the same effect as mixing it with yogurt etc? Loretta – sweet tooth likes on its own…it can be used as a spread for bread as well..however making it diluted with yogurt helps to have it guilt free…. This looks tooooooo good Chitra!! n sounds sooo refreshing!! Thanks for reminding me about rose petal jam – haven’t had it in the longest time. I used to eat it just with yogurt, but this sounds even better. I had no idea it was so nutritious. Thanks for bringing it to the party. Oh boy does this ever look delicious and refreshing. Thank you so much for bringing! I have figs in the fridge that are in need of being used quickly before they expire, so I may indeed try your wonderful recipe! So nice Sue you liked it..wait to hear how it turned out for you.. Thanks Sreejith for the visit…happy you liked this recipe.. This looks wonderful for the summer! Yes Gretchen…Just to beat the summer exploring few thirst quenchers..
Thatz so sweet of you Jen. …thanx a ton…. Thanx Naina…..it was relishing for the weather….glad you liked….